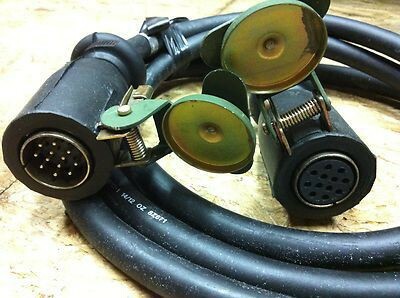 The "Ruggedized Converter Cable" is the one the military uses. 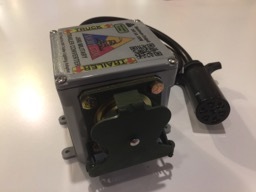 It has a 7-Way RV socket (round center pin surrounded by six flat blades) plus a 4/5 Way flat socket for your trailer and is mounted in a cast aluminum housing. The Ruggedized Converter Cable comes in "383" Green, "686" Tan or black. 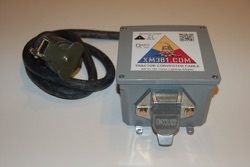 The "Standard Converter Cable" is electrically identical to the Ruggedized Converter Cable but is mounted in a grey ABS enclosure. 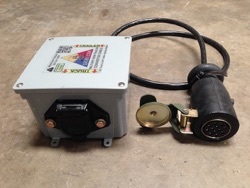 Both plug into your 12-Pin NATO trailer socket and convert your trucks 24 volt power to a regulated 12 volts and supply up to 240 watts (20 amps) to your trailer's lights. The "Ruggedized Frame Rail Mounted Converter" is also electrically identical to the Ruggedized Converter Cable and mounted in a cast aluminum housing but designed for permanent installation. 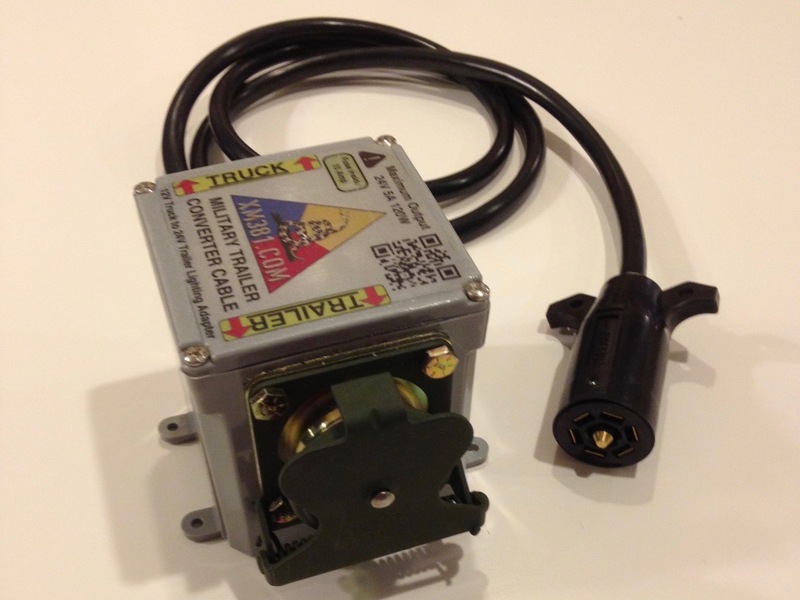 It plugs into your trucks composite tail light harness, no cutting or splicing required, and bolts to the frame rail. The price listed includes FedEx Ground shipping within the USA. Please contact us for expedite or international shipping costs. Notify us for use on a truck from outside the USA. Every country wires their 12-Pin NATO trailer socket a little different. 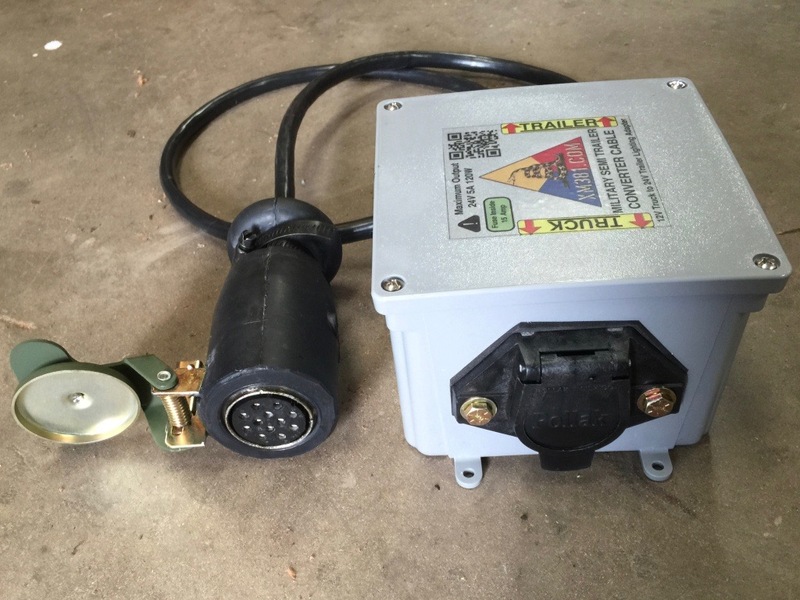 The Tractor Converter Cable has a 7-Way round pin SAE J560 style trailer connector and works with any 7-Way round pin trailer but also provides proper separate turn and stop lighting circuits for semi-trailers. The ABS version operates semi-trailer air ABS systems, works with non-ABS trailers too. 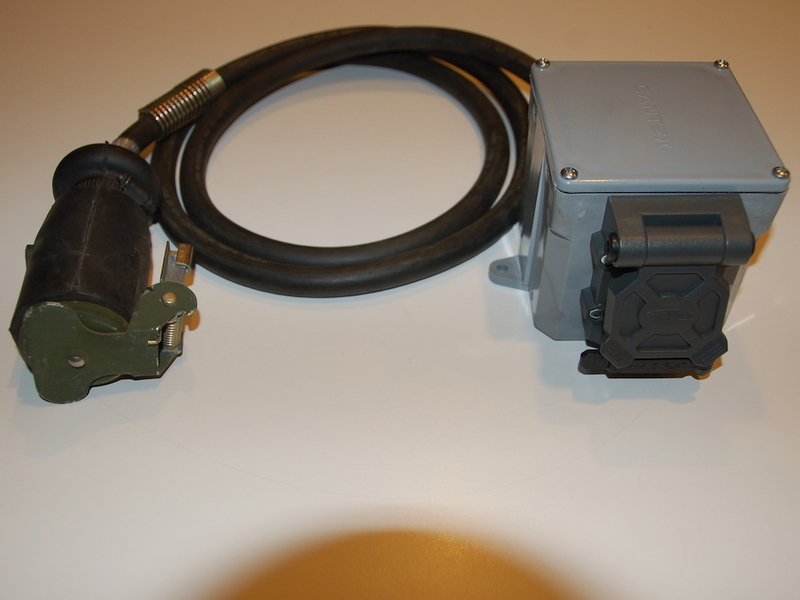 Both are available in a "Ruggedized version" They electrically identical but are mounted in a cast aluminum housing. The Ruggedized versions come in "383" Green, "686" Tan or black. 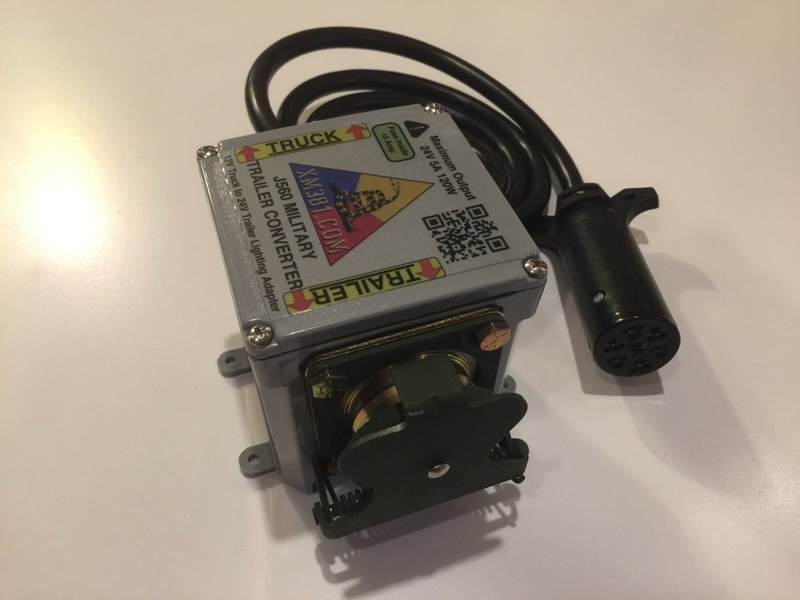 All plug into your 12-Pin NATO trailer socket and convert your trucks 24 volt power to a regulated 12 volts and supply up to 240 watts (20 amps) to your trailers lights. The ABS version provides an addtional 240 watt power source to operate the trailers ABS controller, works with non-ABS trailers too. Notify us if your semi-trailer has amber/yellow turn signals. We make a minor wiring modification to support diffrent colored turn signals. This change does break compatibility with trailers that use shared turn/stop lamps, like some tag trailers (all semi-trailers use seperate stop/turn lamps). The Ruggedized Combo Converter Cable has both a 7-Way J560 round pin socket for semi-trailers and a 7-Way RV socket plus 4/5 pin Flat sockets for bumper pull, gooseneck or 5th-wheel trailers. 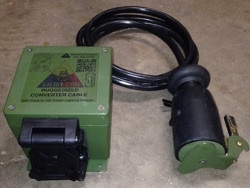 The Ruggedized Combo Converter Cable is a combination of a Standard Converter Cable and a Tractor Converter Cable all in one box. 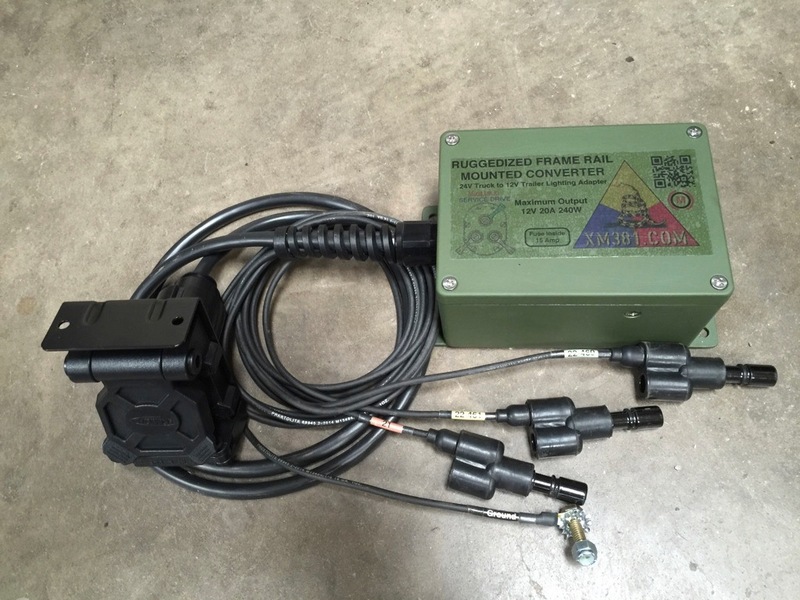 The Ruggedized Combo Converter Cable plugs into your 12-Pin NATO trailer socket and convert your trucks 24 volt power to a regulated 12 volts and supply up to 240 watts (20 amps) to your trailers lights. 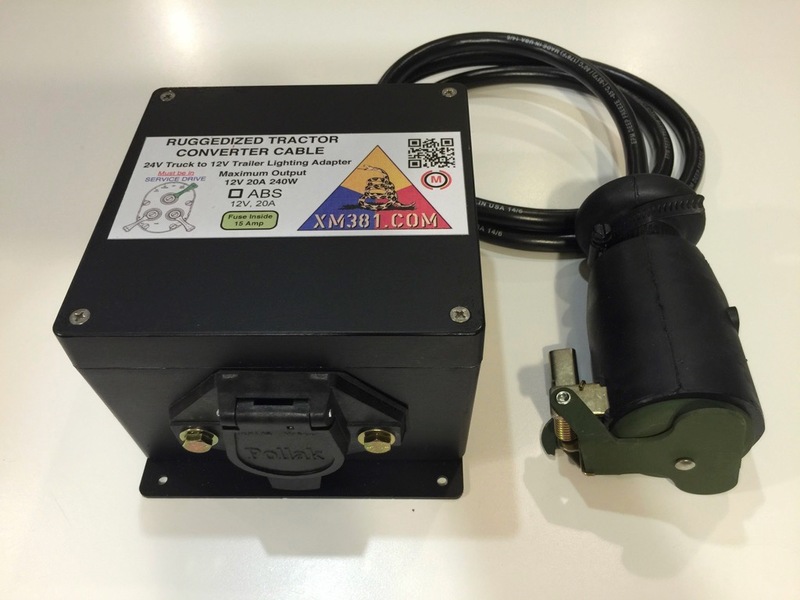 The ABS version provides an addtional 240 watt power source to operate the trailers ABS controller, works with non-ABS trailers too. 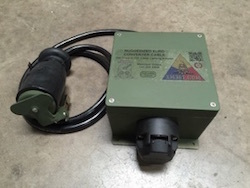 The "7-Way RV Military Trailer Converter", "J560 Military Trailer Converter" and "Military Semi-Trailer Converter" are for pullling military trailers behind civilian tow vehicles without having to make any changes to your military trailers 12-Pin NATO connection or 24 volt light bulbs. 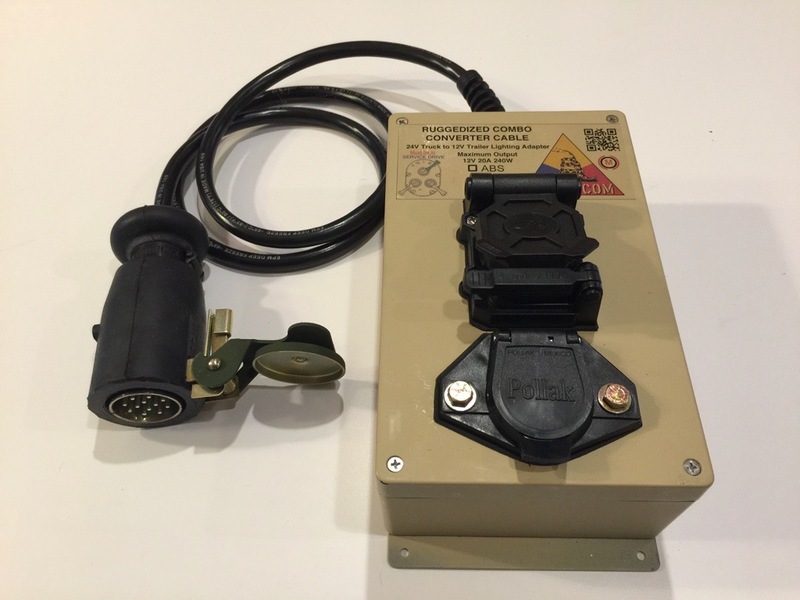 The "7-Way RV Military Trailer Converter" is for pulling a military trailer with a tow vehicle that has a 7-Way RV style socket, like a pickup truck. 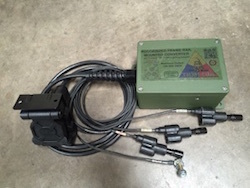 The "J560 Military Trailer Converter" is for pulling military trailers that have a 12-Pin NATO trailer cable attached to them, or an "intervehicular cable", with a tow vehicle that has a J560 7-Way Round Pin socket, like a heavy duty truck or semi tractor. The "Military Semi-Trailer Converter" is used in place of an intervehicular cable for pulling military semi-trailers with a tow vehicle that has a J560 7-Way Round Pin socket, like a semi tractor. 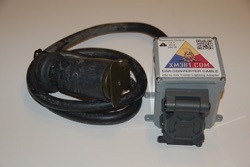 The "Military Semi-Trailer Converter" plugs into the NATO socket on the front of the semi-trailer. 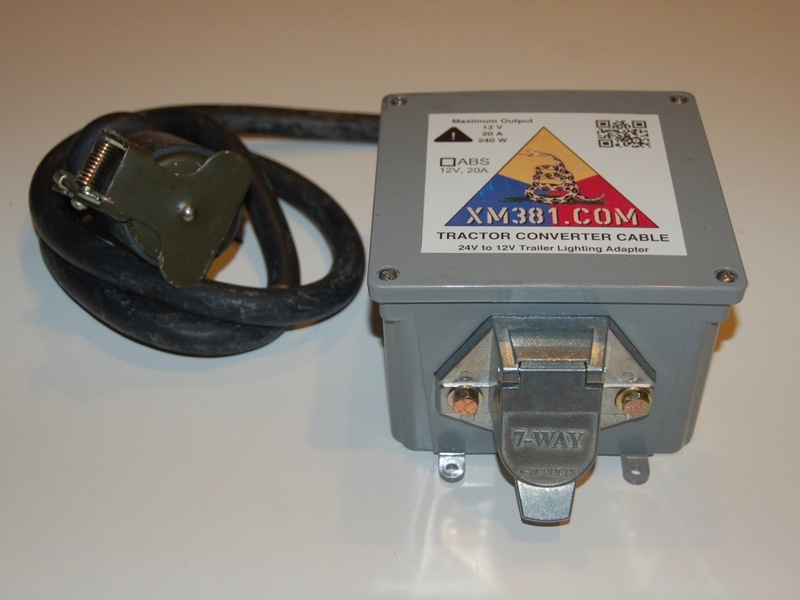 Use a standard J560 coiled power cable to connect the tractor to the converter. All plug into your tow vehicles trailer socket and convert your trucks 12 volt power to a regulated 24 volts and supply up to 240 watts (10 amps) to your military trailers lights. Notify us for use on a trailer from outside the USA. Every country wires their 12-Pin NATO trailer plug a little different. 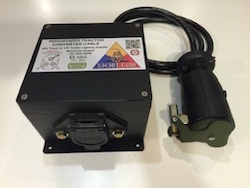 The Ruggedized Euro Converter Cable has a 7-Way round pin 12N style trailer connector and provides proper separate turn and stop lighting circuits for European trailers and caravans. The Ruggedized Euro Converter Cable plugs into your 12-Pin NATO trailer socket and converts your trucks 24 volt power to a regulated 12 volts and supplies up to 240 watts (20 amps) to your trailers lights.